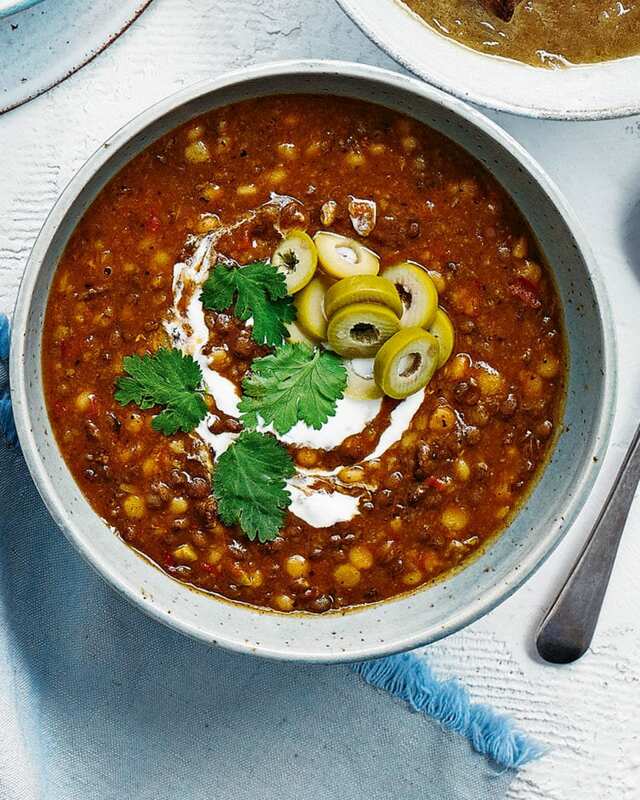 A hearty, spicy beef harira soup spiked with ras el hanout, harissa and fresh coriander. Top this Moroccan-inspired bowlful with extra olives and a dollop of creamy Greek yoghurt to serve. Heat the olive oil in a large casserole over a medium heat. Add the British beef mince and cook for 6-8 minutes until browned, breaking up with a wooden spoon as it fries. Remove the mince with a slotted spoon to a plate and set aside. Add the chopped onion to the pan and fry for 8 minutes until starting to soften, then stir in the crushed garlic clove and fry for 2 minutes more. Add a the tin of chopped tomatoes, ras el hanout spice mix and harissa paste to the onion and cook for 5 minutes until slightly reduced. Return the browned mince with the beef stock and lentils, then simmer for 20 minutes. Stir in the giant couscous and cook for 10 minutes until tender. Stir in the green olives and a large handful of freshly chopped coriander, then taste and season. Spoon into bowls and top with a dollop of greek yogurt, a few more sliced olives and more chopped fresh coriander. Reduce the harissa paste if you’re not keen on spice. Next time, swap the beef mince for lamb or add chickpeas instead of giant couscous. Make the soup up to 3 days ahead, cover and keep in the fridge. Freeze portions in food bags for up to 3 months. Add a splash of water when reheating.